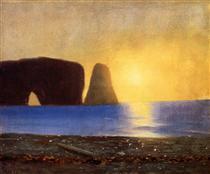 William Bradford (April 30, 1823 – April 25, 1892) was an American romanticist painter, photographer and explorer, originally from Fairhaven, Massachusetts, near New Bedford. His early work focused on portraits of the many ships in New Bedford Harbor. In 1858, his painting New Bedford Harbor at Sunset was included in Albert Bierstadt's landmark New Bedford Art Exhibition. He is known for his paintings of ships and Arctic seascapes. He went on several Arctic expeditions with Dr. Isaac Israel Hayes, and was the first American painter to portray the frozen regions of the north. 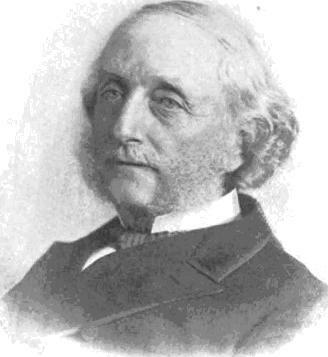 In 1862, Boston, he was an art teacher to Charles Dormon Robinson. With funds provided by LeGrand Lockwood, Bradford traveled to the Arctic aboard the steamship Panther in 1869, accompanied by photographers John L. Dunmore and George Critcherson. Upon his return, Bradford spent two years in London, where he published an account of his trips to the north, entitled The Arctic regions, illustrated with photographs taken on an art expedition to Greenland; with descriptive narrative by the artist. (London, 1873) In 1874, he was elected into the National Academy of Design as an Associate member. He was associated with the Hudson River School, not an institution but rather an informal group of like-minded painters. He adopted their techniques and became highly interested in the way light touches water and how it affects the appearance of water surfaces and the general atmospherics of a painting. He compositionally balanced many of his paintings by creating a counter-subject and by placing darker colors around the edges, framing and counteracting the center's better-lit subject. Labrador Fishing Settlement William Bradford ?